So, where was I? Oh yeah. TEN DAYS! I think I shall have something fun to post here for every day, leading up to -- as soon as Powers That Be give me the go-ahead -- some fun announcements! So check back. 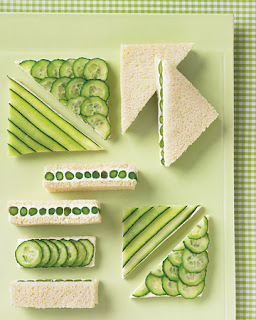 Please do have a cucumber sandwich. *Happy Laini sigh. 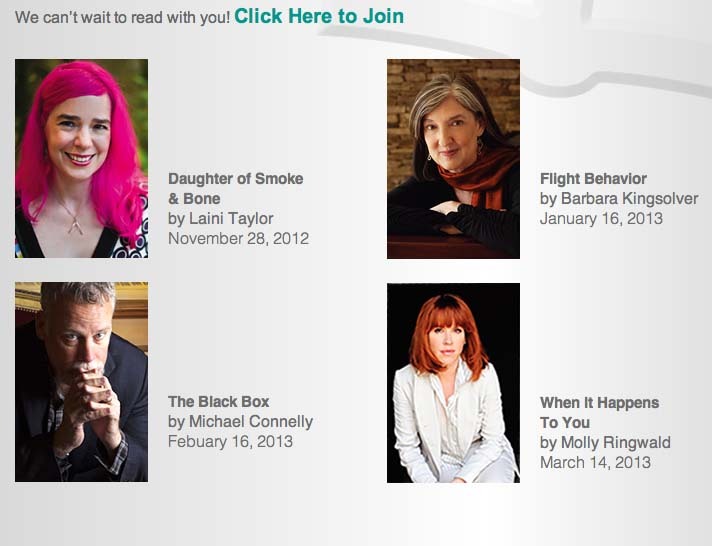 * It's almost like I'm standing next to Barbara Kingsolver ... No. Nevermind. By that logic, I'd also be hovering over Michael Connelly's head, and I don't think he'd appreciate that. Let's just keep it virtual. THIS IS SO GREAT! 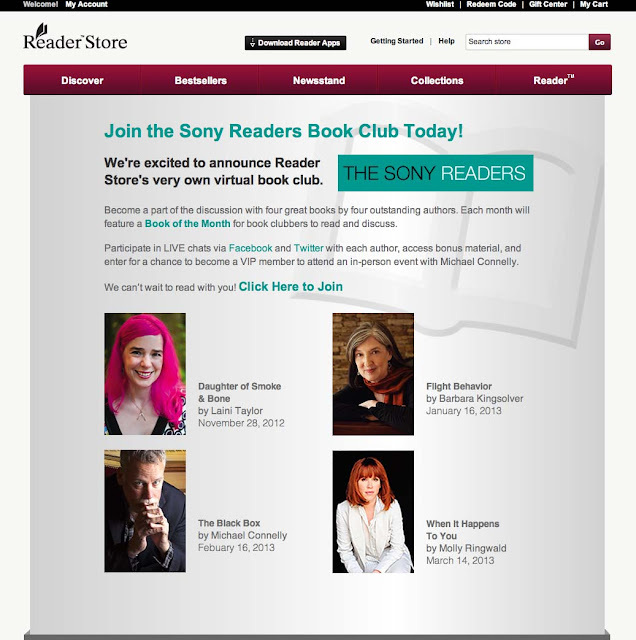 Sony Readers is launching a book club, wherein they will select 25 applicants to chat online with the author and fellow book clubbers each month. Meaning, to chat with ME and BARBARA KINGSOLVER and MICHAEL CONNELLY and MOLLY RINGWALD! AND you will also win an all-inclusive trip to Los Angeles for a book event with Michael Connelly!!! How fantastic is this? I am so so so thrilled that my book (DAUGHTER, not DAYS) is the inaugural book of this super awesome club. Thank you, Sony!!! To apply, click HERE and check it all out. Apply and come join me in the book club! The mantle. Gives the impression we have done a lot of decorating, but this is mostly it. A witch here, a pumpkin ghost there, a quick arrangment of gourds on the dining room table. Sigh. Blogs and Pinterest do make one feel inadequate, like there is this lovely life being had by others, people with time to build tablescapes and such like. But this mantle was fun. The bat garland was the work of about 15 minutes this afternoon, when the sitter called at the last minute with a cat emergency and I had to shift from work mode to Clementine-entertaining mode. Like: oh darn. (YAY!) More Pie, plus a craft opportunity! I googled 'bat garland,' and lo. Here was this, printable template and all. Couldn't be easier, and it looks so cute! As for the little pumpkin bats, those are: mini pumpkins + black paint + googly eyes + black paper cut-out wings. Easy and fun. Clementine loved the googly eye placement. If you have small children and you do not have googly eyes on hand, get some. In the words of Crafty Chloe, "googly eyes make anything less boring." It was around 3 or 4 p.m. that it dawned on me that Clementine was still wearing her pajamas and had not been out of the house all day. (This is not usual.) *shrug* We did puzzles and the Twelve Dancing Princesses matching game, and then, I thought I'd see about making some pom-poms. I recently added several sizes of pom-pom makers onto an Amazon order, with visions of pom-pom Christmas crafts in our near future, and they had arrived, so. And guess what? A huge hit! It turns out pom-pom makers are totally three-year-old-friendly. Yay! Clementine kept emphatically announcing, "This is fun!" and "I love this!" which was awesome. We made all sizes of pom-poms, and then Jim came down from the studio and we had soup for dinner, and carved our pumpkins. It was a lovely day, and when bedtime finally rolled around, Clementine was still in her pajamas, ha ha! Congrats on the book club! That is so neat! Will definitely have to check it out! I'm so excited for the book! But, I have a problem: I'm from Mexico. Congrats and I'll be waiting the spanish edition. Yay I just added countdown!!! I have been listening to Daughter of Smoke & Bone in preparation of Days of Blood & Starlight released. But had to stop realizing it would not do to bawl my eyes out while at work.